A gripping story rife with suspense, sexiness and mystery… the kind that makes your heart pound as you anticipate what happens next. This is my first experience reading a story by Laura Griffin and I can assure you it won’t be my last. Her engaging story telling has a way of pulling you in, not only through the writing, but also with a plot fabricated with layers of mystery, with twists and turns that kept me devouring the pages to see what happens next. It’s a character driven story where we get to know both Detective Andrea Finch and Agent Jon North through their reactions to the events that unfold in the story, their always-on thoughts and motivations, and the sexually charged moments they share. We get a sense of how they think, what fuels them, what troubles them. The story itself is a romantic suspense story, but the story isn’t driven by the romance, rather, it’s enhanced and enlivened by it. The plot itself is gripping and mysterious as these two people chase down a criminal mastermind at the precipice of striking again… or so they think. Andrea Finch is a well-respected detective at Austin PD until recently her gut instincts resulted in her suspension. Her funk is suddenly interrupted however, when she gets a call from her younger brother Gavin, asking her for money. When she realizes Gavin has quit school and could be involved with some–at best–questionable people, she decides to follow those infamous gut instincts again, taking matters into her own hands and checking things out. She heads to the Texas border in search of her brother, but instead of finding him, Jon North finds her. Jon North is an FBI agent working undercover, trying to crack a case that people dismissed years ago, but one he feels is hotter now more than ever. Jon is handsome, rugged, smart and stubborn. He, like Andrea, is married to his job, fueled by the thrill of the chase, the allure of the puzzle. He’s got a feeling about this case and he feels Shay Hardin, an anti-government extremist, is a whole lot more trouble than what he seems. When the case brings him face to face with Andrea Finch, sister to someone who is working with Hardin on the inside, he sees her as a possible “in” to helping him uncover what’s going on in the mysterious and dusty Lost Creek Ranch where Hardin resides. Andrea, however, is tenacious, smart and resolute on helping her brother. She knows that Jon is likely working her to get Gavin to talk. Problem is, however, the more time Jon spends with Andrea, the more he seems to be drawn to her, forgetting his initial motives. Their investigations continue to collide, and as Jon confides in Andrea his theory of Hardin’s much broader and deadly scheme, a series of events brings them closer to danger each time, and closer to each other too. The pages heat up with sizzling, sexually charged scenes that made me want to will these two people to collide in every possible way! Andrea must overcome her impulse to run away every time a serious situation confronts her. They both need to trust each other. And they must both work together to fit all the pieces to this deadly puzzle as the clock ticks down the time to when Jon’s case is shut down permanently and Hardin strikes at a major level. Andrea Griffin is an expert at keeping us in a chilling, thrilling sense of suspense throughout. I loved the natural draw of the story. Loved the interactions and banter between Andrea and Jon too. 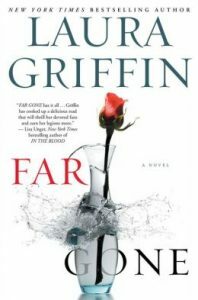 If you love suspense, intriguing characters and a relentlessly consuming plot, you will love Far Gone!